LEGO Education® materials have enriched our homeschool in untold ways. From learning to write stories, to learning about simple and motorized mechanisms and simple machines, it is safe to say that anything from LEGO Education® is a tremendous learning resource! The most recent resource we have been using, BuildToExpress, is specifically designed to stimulate your child's creative thinking and imagination. BuildToExpress Core Set The core set contains 200 elements that developers have carefully selected to peak students' interest in creating metaphors and telling stories. The set also comes with a building plate and a convenient storage container. BuildToExpress Guide & Activity PackThe guide and activity pack is what truly makes this a unique resource. While designed for classroom use, we have been using it on an individual basis (but I bet it would be FABULOUS for a co-op class, too!). There is a teacher's guide included, as well as a DVD Rom that includes all of the printables for 30 challenge cards and a challenge card creator. These two resources together allow my son to use these LEGO bricks to think more deeply about literature we are reading, use his creative skills and imagination, and SO MUCH MORE. Watch this video from LEGO Education® about BuildToExpress. You can also visit this page to read all about BuildToExpress. *Note: This is done from a classroom perspective - as I have (and will address later) emphasized, this product can easily be adapted for use in your homeschool. The challenge cards contain different cross curricular topics to get your student thinking and creating. Since we love literature, I chose a literature challenge card set to share with you - and this was also the first activity Grant did with BuildToExpress. We usedThe Sword in The Tree (a book Grant just finished), and talked about the book and Grant began to build. I love how this first card encouraged him to THINK about the main character and other characters in the book. Grant built this simple scene of Lord Weldon trying to escape the dungeon in Weldon Castle. We had a great dialogue while he was building. *I know from also having a seventh grader that these verbal and creative skills will translate into STRONG WRITING in the years to come! You can see the remaining challenge cards in this activity - and with each one he talked with me more and continued to build. I can see us repeating this process with future books. Challenge cards 3 and 4 are IMAGINE and CONCLUDE. There are many more challenge cards that come in the BuildToExpress Activity Guide, and you can even create your own challenge cards. The set comes in a compact box that is easy to store. The pieces are engaging and A LOT can built just from a free build with the 200 elements included. 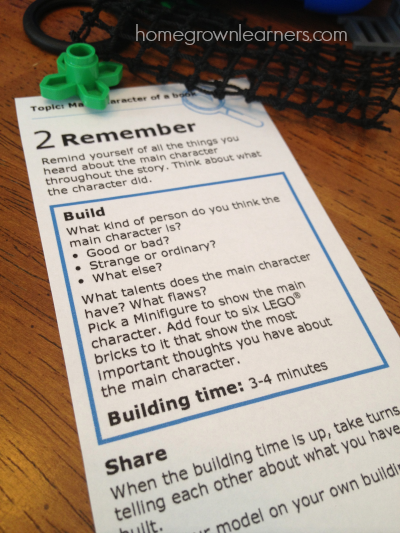 The guide and activity pack help me organize an entire LESSON surrounding the LEGO bricks. Grant doesn't even realize we are working on elements of literature, or a science concept. All he knows is LEGO! LEGO Education® leaves no stone unturned. They give you MORE THAN ENOUGH direction, challenge cards, and teaching ideas. The potential in our homeschool is something I love, but I also love the potential to use this in a co-op or LEGO club setting. It can work well with individuals or groups. We have just scratched this surface with this resource, and I am SO excited!